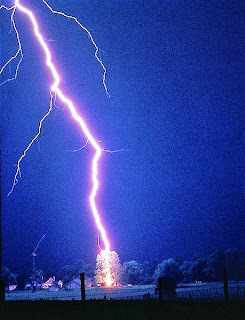 lightning hits a tree - OUCH. Maintaining your physical and biological fitness means staying healthy and injury-free. This includes avoiding weather hazards, even more than dangerous animals, such as some sharks! For all you outdoor fitness buffs, did you know that lightning is not only powerful and unpredictable, but common? Lightning is a big discharge of electricity: strikes can carry over 100 million volts, with 30,000 amps of charge. 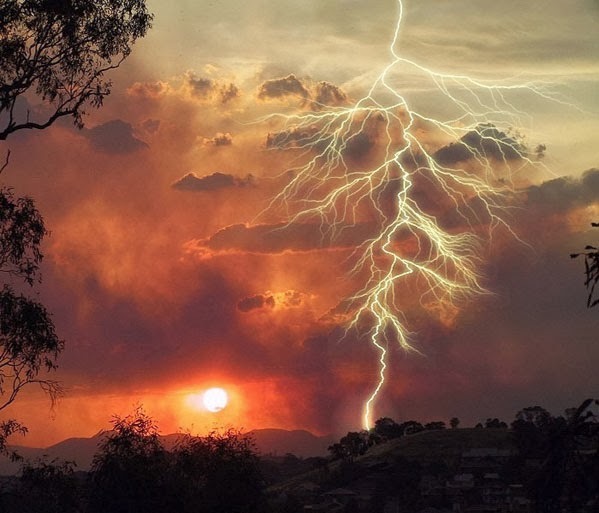 The energy lightning produces heats the air around it anywhere from 18,000 degrees Fahrenheit (9,982 degrees C) to up to 60,000 degrees Fahrenheit (33,315 degrees C). Needless to say, it burns. Lightning usually strikes the tallest object around, but it can travel 10-20 miles before striking the ground, so a storm in the next town can hit in front of you, even if the skies above you are blue. At any moment, up to 1800 thunderstorms are happening somewhere on Earth. Worldwide, lightning strikes the Earth 8 million times per day(!!). This is good, though, because it maintains the electrical balance between Earth and its atmosphere. This is also bad for many people, because strikes can be devastating. Strikes kill thousands of people per year (estimates vary, up to 24,000, but numbers are decreasing as fewer people work outdoors on farms or ranches and more move from rural to urban areas). About 10 times more people are hit by lightning and survive, but many experience serious long-term effects, including burns, scarring, brain damage, and cardiac arrest. Severe nerve damage is common among survivors, who often report muscle twitches and cognitive problems like memory loss, an inability to concentrate, or personality changes. This zippy 2.5-minute video, one of a cool series of science-y videos at MinuteEarth, explains the strike and how to avoid it! As the video reminds us, When Thunder Roars, Go Indoors. If you see lightning and then hear thunder before you can count to 30, the lightning storm is close, so it's time to head inside. Even if you are in the middle of your fastest tempo run or a championship football/soccer or ultimate frisbee game! a beautiful site from far away! Make it a strong building, with wiring and metal plumbing that direct the electrical charge away from you and other people inside. And don't talk on a charging mobile or land-line phone or use electrical appliances (note to self: this includes your laptop!). If you are in a car, make it a hard-top model, and don't lean on the doors or other metal parts. The US Federal Emergency Management Agency (FEMA) also recommends staying indoors until 30 minutes after the last clap of thunder. Click here and here for more lightning safety tips -- enjoy the beauty from inside!